An estimated 11 million undocumented immigrants currently reside in the United States, and in recent years, the US government has expanded the use of immigration detention [http://lirs.org/alternatives-to-detention/] and other harsh practices, resulting in the separation of families and the suffering of communities nationwide. Moreover, many close family members must wait years, even decades, to be able to enter the United States to reunite with their loved ones. On October 2nd, Democratic leaders in the U.S. House of Representatives introduced the Border Security, Economic Opportunity, and Immigration Modernization Act, H.R. 15—helping jump start the process for immigration reform in the House. Currently, the bill has 170 co-sponsors, showing strong support in the House. H.R. 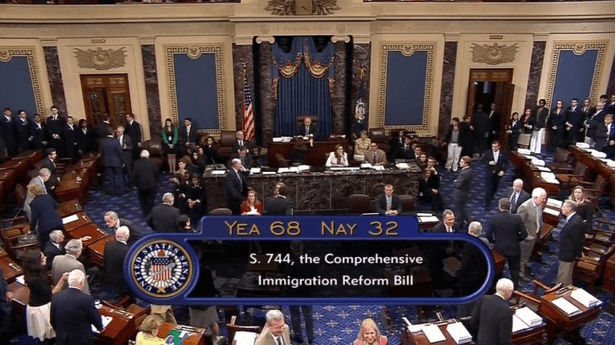 15 is based on the Senate’s comprehensive immigration reform bill, S. 744, which passed with strong bipartisan support in June. Significantly, the bill replaces the Senate’s widely criticized Corker-Hoeven “border surge” amendment with Rep. Michael McCaul’s (R-TX) bipartisan border security bill, the Border Security Results Act of 2013(H.R. 1417), which the Homeland Security committee passed unanimously in May. The McCaul bill takes a more goal-orientated approach to border security, requiring extensive reporting and metrics to measure progress and accountability, and does not include the massive border spending increases that the Corker-Hoeven amendment required. Like S. 744, this legislation would make many of the 5 million undocumented women and one million undocumented children currently in this country eligible for legalization and, ultimately, full citizenship. It would also reunite many families, protect important due process rights, and expand the use of alternatives to detention. However, H.R. 15 isn’t a perfect bill. It is a compromise bill which contains the same concerning gaps found in S. 744, including triggers that tie legalization to border security. Despite this, the bill represents sensible and humane solution to fixing our broken immigration system in a way that treats women and children fairly. The introduction of H.R. 15 mirrors the strong public support for immigration reform and highlights the importance of keeping immigration reform on the forefront of the national agenda.